Kartia aims high, and marches to the beat of its own drum. We aren’t sure a game with such stylistic flavor could be made today. Not in an era of “marketing research” and “maximum demographic penetration.” Pop-culture games that come out of that thinking lack originality, personality, and perhaps longevity. They’re not likely to garner the same kind of following and fondness Kartia engenders. It rose in an era when unusual games with solid ideas could more easy be brought to market (a space largely occupied by indie developers now). They all occur within a world powered ever increasingly by the mysterious energy of kartia—a sort of elemental creation ability bound into paper. Culturally, Japan is more conducive to religious elements, and they aren’t shy about sharing them. Called “Rebus” there, and “Legend of Kartia” in Europe, in North America it’s just “Kartia.” We’ve seen it described as “cerebral.” That’s accurate, although if the implication is negative, we disagree. Almost every aspect of the game, be it mechanics, story, music or pacing is deliberate and thoughtful. A final standout aspect of Kartia is the ability to create temporary warrior phantoms or “dolls” to fight on your side in battle. This is a great, uncommon, and fun mechanic that needs to be used more in other games. We couldn’t find any Kartia cosplay! *sigh* But cool fan artwork is fun. Something to Write Home About: The character’s personalities and inner workings are fleshed out with journal entries and letters to home. It’s not revolutionary, but it adds depth in a way fitting the deliberate pace. Help From Above: It’s refreshing having a faithful cast of fighters. Average people asking for divine protection. History is filled with the devout thrust into war. It’s conspicuous in its absence if always left out. Some common themes are explored; self esteem issues and- …wait, creating coffee or tea out of thin air? Stay on Your Mark: The cutscene story choreography is extensive and was probably time consuming to produce. It’s not Earth shattering in its complexity. But beat by beat, it’s constantly there to carry the narrative along using those miniature characters we see all game long. Such scenes are like watching short plays. Kartia takes storytelling seriously. Striking a Chord: During moments of surprise or key revelations the game suddenly strikes low piano chords from out of nowhere. It works to emphasize the story, even if it does startle you once in a while. Easy Listenin’: We’re leaving this heading blue, because it was originally in “Good and Bad.” But upon reflection, we found we were able to recall the music. A sign it’s far from forgettable. It’s a large, quality soundtrack—subtle and classy. It could have grabbed us more, and added to the game more forcefully, but overall they took a fitting path. We do occasionally still listen to some of it. The Power of Half: Usually attempts to limit a character’s capacity due to injury fall flat and are frustrating. After all, characters can spend most of their time wounded. Kartia implements an interesting tactical system. Basically characters, even under the best conditions, hit for about half their HP. It is consistent, easy to understand and works surprisingly well. The key shtick of Kartia is creating special units called phantoms or dolls. These temporary fighting units are created with magic and are a great way to express your individual tactical style. There’s a variety of types, characteristics, and elements from which to choose. They operate under a well constructed rock/paper/scissors paradigm. You have to do the best you can with whatever magical abilities your team has, and whatever supplies are available, to make the best phantoms to counter those of the enemy. One does not have to worry about these non-sentient dolls. They are tools to be used up in battle. If you play like us and want to safeguard all your people, these dolls are a true blessing. The two lead characters in Kartia each have their own campaign. Both take place against the same backdrop and occur at the same time. You can choose in which order they are to be played. The male Toxa and the female Lacryma are very different, but build a party from the same pool. When in the course of the story the first time around, the two groups come together and some party members exchange. Whatever choices you make will happen outside your control during the second campaign. It’s an ingenious and a fun way to participate in the same war, and even the same events from two different perspectives. This gameplay mechanic has incredible potential for fun, yet sadly remains one of the least explored of the genre. Some surface terrain changing occurs in Vandal Hearts, where a bridge breaks apart in sections behind you. A fun example is also in Shining Force III. There your party has to navigate a train yard in which the trains move a certain distance each turn. It’s fun and challenging. Creating pits and hills on applicable terrain was fun. Repeated spells increased the deformation. With terrain deformation Kartia goes a technical step past those achievements. Surface elements not only change, terrain truly deforms. The spells you cast raise or lower the ground creating hills or deep pits. In SRPGs, such land formations offer tactical advantages and can make all the difference in battle. What an unusual and welcome mechanic. Would that we saw more of it across the SRPG genre. Human Interest Story: While the action backdrop is large in scale, Kartia never lets the story grow impersonal. The nuanced trials of real people remain center stage (almost insulating you from the war). 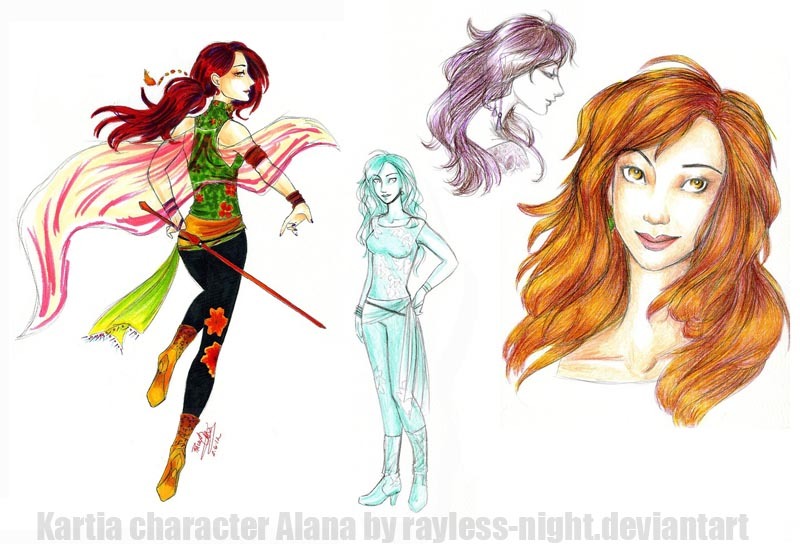 Characters are fleshed out with faults, insecurities, strengths and determination. One can relate to them, although at times it is piled on a little thick. Easy is as Easy Does: (Huh? What does that even mean?) Anyway, the tactical difficulty when in combat is a little too easy. With such a rich magic and creation system, plus the awesome terrain deformation possibilities, every level can and should have a daunting and different challenge. Mano Amano: Legendary Japanese artist Yoshitaka Amano designed characters for the Final Fantasy franchise and Play What You Like entry Front Mission. His art is stylized with fine lines. The Kartia team mistakenly imported it almost directly. Without adjustment, it does not comport with the PlayStation’s crisp needs. Take Amano’s creative ideas and make them work for the platform. This point, originally in Bad, we’ve moved to Good and Bad for Amano’s style adds to Kartia’s uniqueness. Add Classy but Dated Pre-rendered Cut Scenes: Chapters are preceded by short, mature, pre-rendered clips. Not filled with explosions and such, they fit the intellectual tone and pacing of the game. However these, like many cut scenes from 1990s games, come across extra dated. Perhaps budget constraints also played a role. Getting Crafty: The game’s complex magic system can also be used to craft custom weapons, armor and various gear. We appreciate being able to make accessories that fit our playing style. However, the system suffers from the same unintuitive ease-of-use issues of the magic system (see below). The special effects did not make enough of an impression on us to buff or ding. Don’t Beam Them in Scotty: It’s an old trick, and one for which we have little respect. If you’re trying to make a battle harder, plan for that from the start. Beaming in additional enemies who immediately pounce upon your unprepared formations is cheap, unfair and unfun. Don’t get lax because the boss is away. The magic system is… complex. It includes various classes of spells and many modifiers. 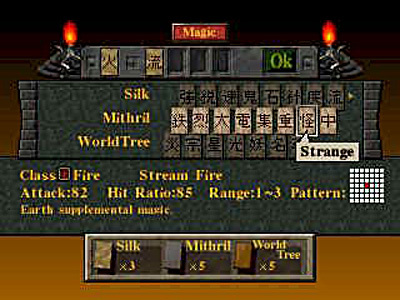 The three primary types of “kartia” which you collect and combine for various spells are silk, mithril and worldtree. It’s an interesting and unique system for which we give the creators credit. How is your kanji reading? And what exactly does “Strange” mean in practical terms in regards to my spell? However the interface used for magic creation as not intuitive nor overly helpful. Additionally the Japanese kanji labeling of the kartia cards are easier to understand at a glance for the Japanese. For English speakers it requires a tooltip style pop-up when each card is selected. And maybe some of those tooltips are not the most illuminating either (see picture above). Overall, many of the combinations don’t make intuitive sense. The elements with which to work aren’t clear. It can turn into a laborious trial and error process. A pity for a system with such potential. Yes, Kartia was “cerebral.” Its methodical pace may be slow for some, although we think many players found it a refreshing, less “in your face” playing experience. Fans of the genre, by its very definition (“turn-based”), are looking for controlled tempo. We found the pacing fitting and looked forward to both the stage play cut scenes and combat. 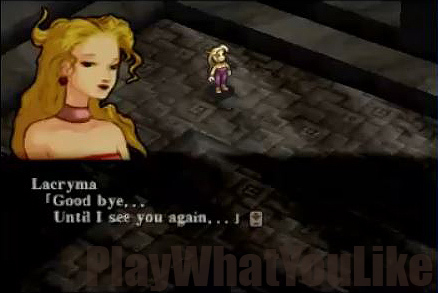 If you think Disgaea is the “coolest most bestest SRPG evAr,” Kartia is likely NOT for you. The game proudly chooses solidity over flash. Substance over triviality. Seriousness over inanity. Kartia wraps up most loose ends in a satisfying way. 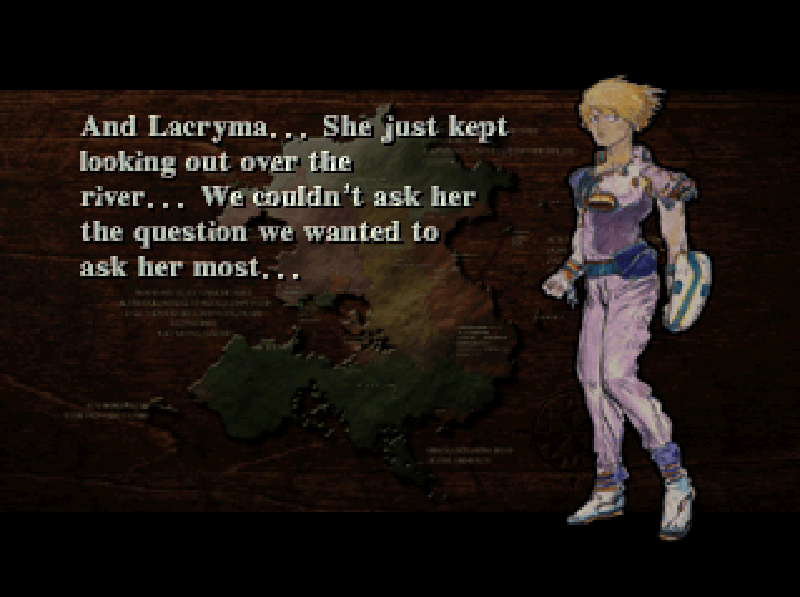 Lacryma’s story ending is particularly poignant. A grown daughter driven to find the whereabouts or final disposition of her famous, lost father. What she finds is fitting and satisfying, though not saccharine sweet. We won’t say, “Play Kartia, it’s awesome!” But there’s no denying its powerful gameplay mechanics. The game is, in our opinion, a fun and interesting adventure absolutely worth taking. However it’s an experience that comes down to taste. 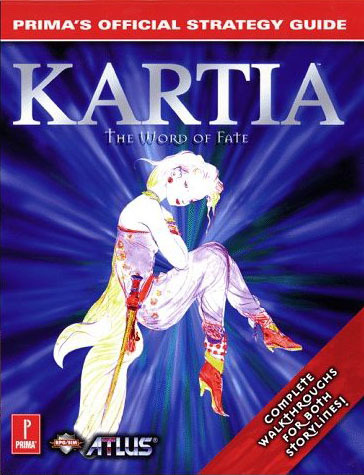 Kartia sits well in our memories along with Fire Emblem, Saiyuki Journey West, and Rebelstar Tactical Command. We would like more experiences like it. 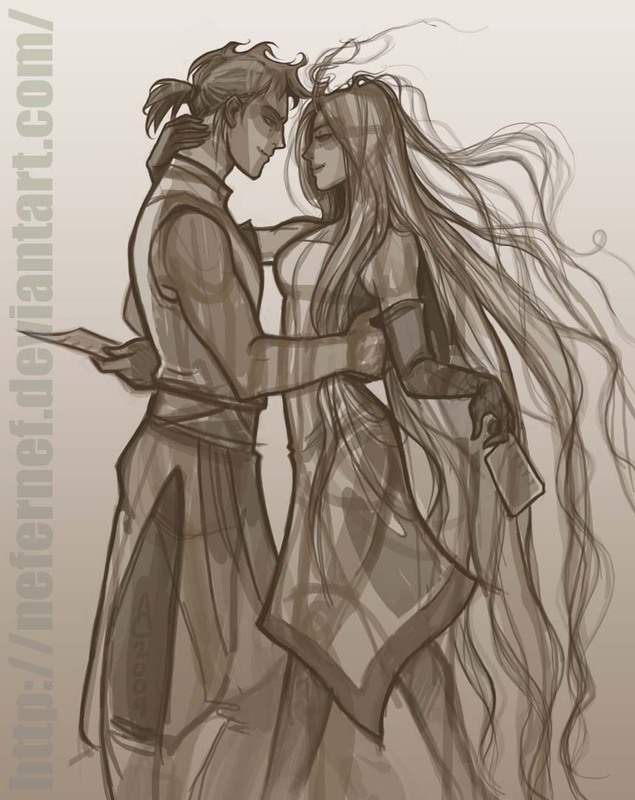 Updated 05/2013: Some new and crisper pictures, more fan art. Added and edited text. Updated 06/2015: Added more fan art, Amano artbook scans, and edited text. The sprite STYLE is a bit bad though. It is wayyyy too underdetailed. But that’s not because of Amano. Thank you JosephSeraph. Your comment gave us an opportunity to reevaluate our thoughts on the Kartia soundtrack. We found the theme coming back to us with an easy thought. A good sign. Like so much of this fine game, they maintain their own unique style even in the score. And seeing how many games offer much more limited soundtracks, we want to give Kartia props for one that is full sized. So we actually moved our point from “Good and Bad” into “Good.” A rare, post posting occurrence. Oh wow I’m glad to hear so! Makes me happy! Kartia & Brigandine will forever remain some of my favourite SRPGs ever, as well as SaGa being one of my favourite franchises for JRPGs. There’s something in their boldness that makes them quite unlike anything else. Speaking of soundtracks, I invite you to try and listen to Brigandine Grand Edition’s soundtrack, an early compositional work by Disgaea’s composer (whose name I can’t remember), which is quite a bit more serious in tone (rare for him) but still has his signature sound style!